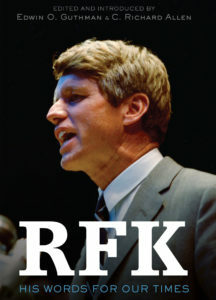 Thank you, Congressman Kennedy, for your remarks and your remarkable embodiment of what Robert Kennedy stood for. Thank you, Mrs. Kennedy—Ethel—and members of the Kennedy family for inviting me to join you again 25 years after the first observance at Arlington, and 50 years since we lost Senator Kennedy. I thank those who have sung and spoken, reminding us once more of the timeless wisdom of Robert Kennedy’s words, and all of you for the efforts you have made over half a century to advance the work he could not finish. I think if he were here today—and as we were told in the invocation, he really is here today—he would remind us that perhaps the words he spoke are even truer today than they were then. In another time of heated debate and deep division, it is important that we remember what he meant to us when we were young and what he means today. In 1968, after a couple of tumultuous years leading up to it, every day seemed to bring a new piece of bad news and a deepening division in America. It was my last semester in college here at Georgetown. If somebody said, “What did you do at the end of your college career?” I would say, “Well, Martin Luther King got killed on April 4th. Just a few days before that President Johnson said he wouldn’t run again. The country was so divided over Vietnam and everybody feared the whole thrust of the civil rights movement could be lost.” As John Lewis proved again, the best remarks given after Dr. King was killed, I believe, were in Robert Kennedy’s finest speech in Indianapolis. We rocked along through two months of turmoil and then he won in California in the primary. I still remember the vote, do you? He lost Oregon by a little bit and then won in California 45 to 42. And God forgive me for being politically incorrect, but I was so glad they had winner-take-all primaries back then. Why am I saying this when we’re all being so lofty? Because he was a flesh and blood man who fought in a tough arena and continued to grow. Today we seem to think our clan and tribe are more important than anything else and require us to be divided from one another. He came, as you see here, from quite a clan. And he did every single thing he could to increase it. And as you know, the Kennedy clan was clearly an Irish tribe. Those of us who share that heritage are proud of it. What is the difference between then and now? The difference is that he embodied the whole message of the faith of his fathers and mothers. Before His Holiness Pope Francis called us to engage in a “culture of encounter,” Robert Kennedy viscerally, instinctively lived a life of encounter. The life of the outstretched hand, not the clenched fist. For his work with them, the National Congress of American Indians, 90 tribes, gave him a tribal name: Brave Heart. His brave heart took him to California to be with Cesar Chavez on his hunger strike; to make a 200-mile trip across Appalachia to see the shacks where parents struggled to feed their children; to visit the Pine Ridge Reservation in South Dakota—in the middle of the Indiana primary race; to enrage the Apartheid government in South Africa by plunging into the crowds in Soweto and shaking hands. He encountered people. And challenged all of us to do the same. His message really, no matter how dressed up in the finest poetry, never changed: We can do better. And because we can, we must. He gave it over and over and over. And while the words were beautiful, there was more. If you weren’t alive then, look at the films that are coming out now. The energy was awesome. And the intensity of his conviction was like a blow torch burning away all those layers of complacency and comfort. Show up. Stand up. We can do better. Fifty years later he would say, “I’m 92 now and you have to listen to me from a distance. I still try to speak to the young.” We stood up for Emma. You know why I love that? Because she and her generation are the first people who have made sensible, sane gun safety laws a voting issue in this country. When I was President, we passed the assault weapons ban and the magazine limit, but we couldn’t make it a voting issue and we got our brains beat out in the next election. When she and her colleagues said “We do not deserve to die in school, schools need not be killing grounds,” America recognized finally that these students need our support not just sympathy. If he were still here today, Bobby Kennedy would say to gun owners, “Nobody is trying to take away your right to hunt, to sport shoot, to defend your family. But we should take away the option to commit mass murder with killing machines, and without adequate background checks.” That’s what Emma did today. And that’s the kind of thing he did viscerally. I never saw anything like it. We’ve got to stop hating each other. It’s bad for us. And by the way, that includes the members of our clans and our tribes. The outstretched hand beats the clinched fist. We thank him after 50 years because we can still feel the energy: in the parades, reaching across the convertible tops; in the shacks of Appalachia; in the depths of Watts; and yes, all the way to Soweto. We can do it all over again. But we have to do it the way he did: speaking to everybody; saying the same thing to everybody; with a heart full of love and an outstretched hand. His legacy has brought us here and will see us on.